The budget feature is enabled with some paid onCourse support contracts. Check your college's support agreement to see if this feature has been enabled for your organization. Use the Class budget feature to determine whether Classes are profitable, predict how many more enrolments they need to break even and create projected budgets across groups of Classes. You can compare actuals against projected income and expenses to determine whether your marketing planning needs adjustment in some areas of your course delivery. A cost that would be incurred even if the Class does not proceed, sunk costs can also be referred to as a "fixed" cost. A cost that is only occurred if the Class proceeds, running costs can also be referred to as a "variable" cost. Go to the Budget tab in the Class window. Here you can see a list of income and expenses for the Class, plus a summary of the Actual and Projected income and expenses. If you have already added a tutor and added a payroll amount, you may already have a cost assigned for the tutor wage. To add a tutor wage, you need to have already assigned the tutor to the Class. You can then define the rate and any associated oncosts. Note that for the tutor wage to be automatically calculated, the tutors name has to be ticked for the sessions they are teaching in the Class timetable. Expenses can also be added. These may include items like room hire, student textbooks and advertising charges. Some expenses may be considered 'sunk', that is, they are incurred even if the Class is cancelled. The Actual summary will show the income and expense given the current students enrolled in the Class. To set an estimate, or budget, type the number of expected students in the Projected field. The income and expenses will then be calculated accordingly. From the Class list window, a range of budget reports are available to assist you with evaluating your program profitability. The Budget Details report shows line by line detail of the budget you have created. The Budgets report will show a summary of the actual and projected income and expense for a selection of Classes. For each item you wish to add to the budget, you can choose if the cost is calculated based on an hourly amount, a per student contact hour amount (per student per hour), per enrolment, per session or fixed. As these reference items change e.g. when another student enrols or when you add more time to the Class duration, the budget items will automatically adjust. Expense items can be capped at maximums and minimums for the Class, have GST applied as needed, have oncosts associated with them (e.g. super, on top of wages) and be deemed as sunk costs. A sunk cost is the cost you will incur even if the Class is cancelled, for example you may considering advertising as a sunk cost. Using sunk costs is important in a detailed budget as it will assist you in determining if it is financially viable to run a Class even if the sunk costs have not been met. As you continue to add items to the Class budget, such as the tutor wage, room hire fees, student fee income, applicable government funding income, resourcing costs and others, the actual and projected summaries will update automatically. If you need to delete a budget line item, simply highight the entry and the click on the trash can icon for that line. 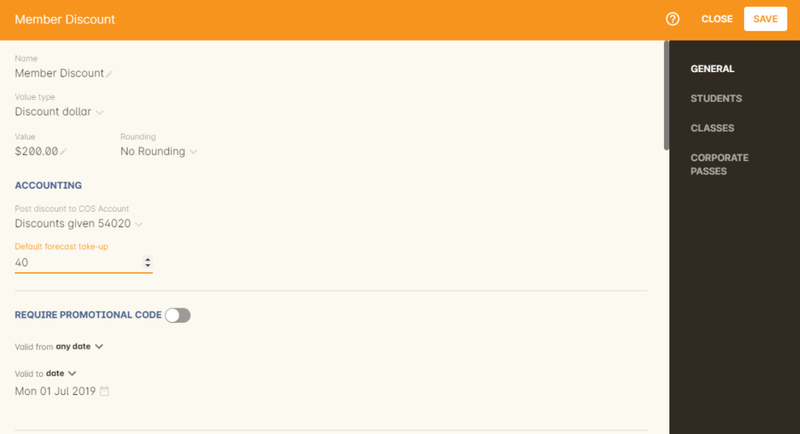 If you wish to edit a line entry, simply double click on the entry to bring up the edit window. An important part of the budget calculations are the projected enrolment numbers you have estimated. This number is an estimate of how many students you believe will enrol in the Class and is used to calculate the figures under the 'Projected' column in the budget tab. The budget will then calculate the enrolment number required to go ahead (meet your refundable costs) and the enrolments required to profit (meet your refundable and sunk costs). This information is displayed both on the general and budget tabs of a given Class. If you do not enter any expense items for a given Class budget, the information on the number of enrolments required to make a profit that is found on the general and budget tabs will be suppressed. As well as reflecting all fee income within a given Class, the budget tab allows you to track discounts. With each discount type listed as a line item within the budget. When defining the paramaters of a given discount, you can also enter an estimated percentage of students within a given Class who are likely to take up this discount. This figure is set within the value tab of the discount and is identified as the default forecast take up. The default forecast take up of a given discount will be applied to all Classes that have that discount, but if you wish to adjust the take up percent figure on one Class, you can do this by double clicking on the discount line item within the budget tab of that Class. Once a discount has been assigned to the Class and you have entered a figure for the projected number of enrolments that are likely to be received for a given Class via the budget tab, the budget will calculate the discount amount based upon the percentage of projected enrolments that are likely to take up that discount. The dollar value of discounts given during the enrolment process will be visible in the budget tab against their corresponding discount strategy. If you give a manual discount during enrolment, the balance will be deducted from the total income field, but not visible in the discounts section of the budget tab as it is not linked to a pre-exisiting discount strategy. 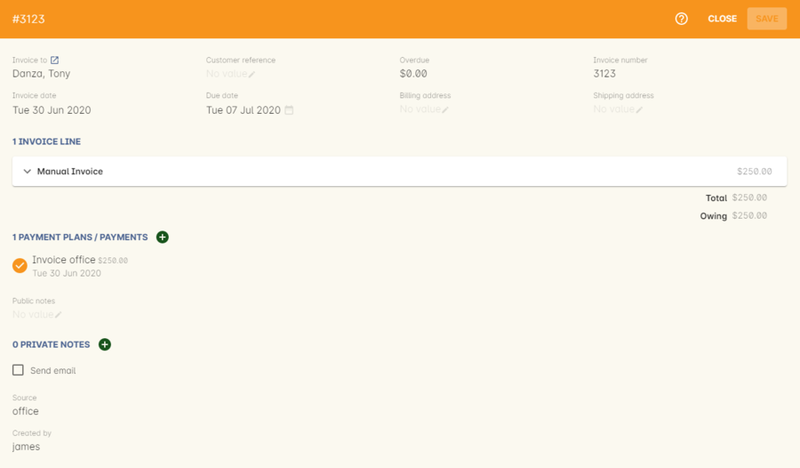 You can create a manual invoice for income earned through other means (e.g. government funding) and link it to a classes budget. Any invoice linked to a class will be counted toward the class income automatically, and the pre-paid fee liability rules of this class will also apply to the invoice. To create the manual invoice, open the 'Invoice' window. 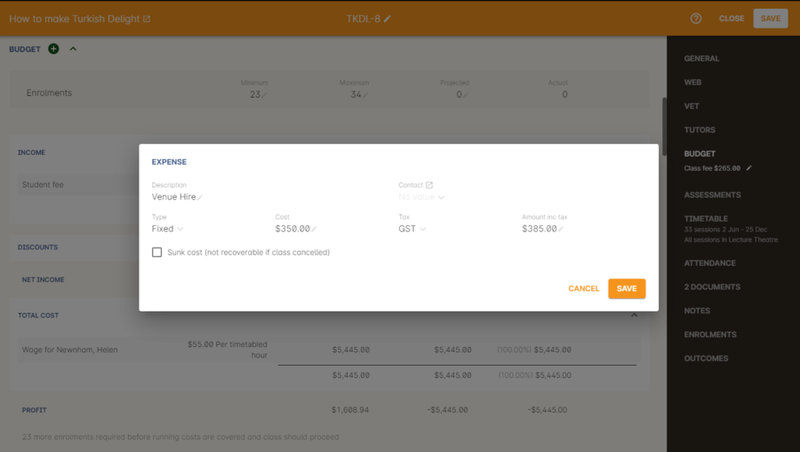 This can be found by going to the top menu and going Financial -> Invoices or by finding it in the Accounts tab on the dashboard. A sheet will appear that will let you link this invoice to a class. You will have to fill in information such as Title, Quantity, Price, Income account and what course and class code it's linked to. 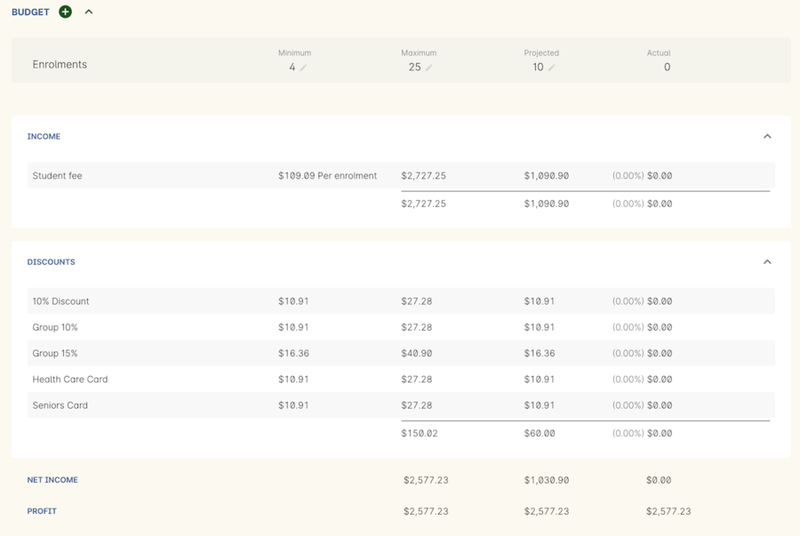 You will be able to see this manual invoice in the Budgets tab of the selected class. 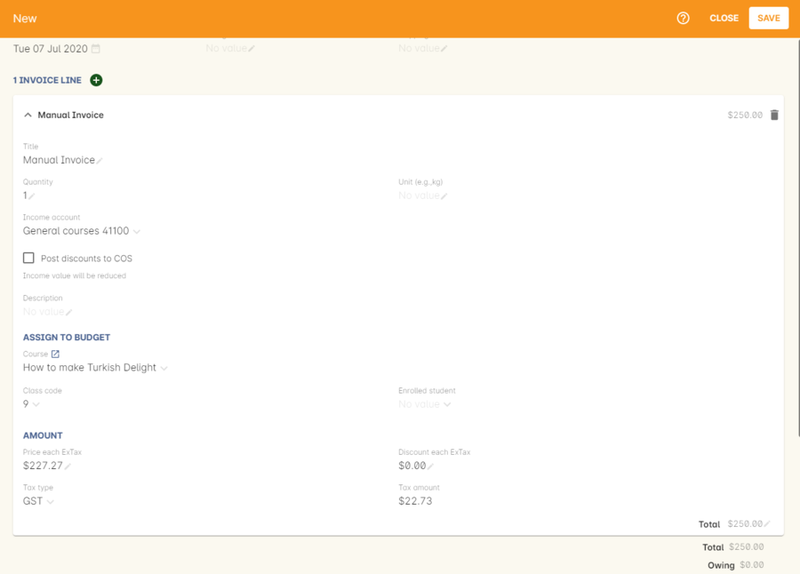 It will appear under the table that says 'x custom invoice(s)' above it.